Over on All Facebook there is an interesting post on how JVC USA is using a “Like it to Win it” sweepstakes to rapidly build up fans and drive frequent engagement on the JVC Facebook Page. Developed with RFI Studios (part of Ruder Finn), the campaign has been a great success. But does it violate Facebook’s promotions guidelines? The format of the 60 day sweepstakes is simple and compelling. Users just “like” the JVC page, submit their email address and then come back every day to “like” the wall post of the day for a chance to win a featured prize (a JVC product). With valuable prizes like TVs, camcorders and stereo equipment the “Like it to Win it” promotion is definitely working. Prior to the start of the sweepstakes in early July the JVC page reportedly had about 1,000 fans. As of today it has 36,782 fans. And many fans are coming back regularly. According to Ruder Finn the page currently has a daily active user base of over 10,000 fans. If there are 10,000 active fans daily you would think they’d all be “liking” the post of the day since that is primarily what is driving the repeat visits. But 2,000+ likes per wall post is impressive. There are some great charts from Facebook Insights in the All Facebook post that demonstrate the dramatic increase in “likes” and user interaction since the start of the sweepstakes; check those out. The high level of engagement is pushing JVC’s quality scores through the roof, giving them more exposure and creating a viral loop that brings in more fans and more interaction. The challenge is how to keep that momentum going once the campaign is over. It is hard to imagine many users coming back to the page on regular basis without such a compelling incentive. But the promotion has worked very well in the short term and it will be interesting to see how JVC and Ruder Finn try to sustain a realistic amount of growth and engagement after it is finished. So all this sounds great, but does it violate Facebook’s guidelines? Apparently it does. In the comments of the All Facebook post two people involved in the promotion (author Dennis Yu of BlitzLocal and Ruder Finn’s Andy Pray) have insisted that the sweepstakes was implemented with Facebook’s knowledge and approval. But the post was later updated by Yu to say that Facebook had notified them that the sweepstakes does in fact violate its Promotions Guidelines. So it is ok for JVC to require fans to “like” their page, but it may not be ok to require them to “like” individual wall posts to be eligible to win specific prizes. The current Promotions Guidelines were instituted a while back as part of a crack down on the use of sweepstakes and contests. Some marketers have felt that the guidelines are too limiting or controlling but among other things Facebook is trying to prevent significant manipulation of the news feed. Of course everyone tries to facilitate engagement on their Facebook Pages and increase exposure in users’ news feeds; that’s a basic component of Facebook marketing. But tying this to the ability to win prizes appears to be crossing the line. The All Facebook post was updated about the violation on Friday August 14th so I can only assume that JVC USA and RFI Studios were notified as well. 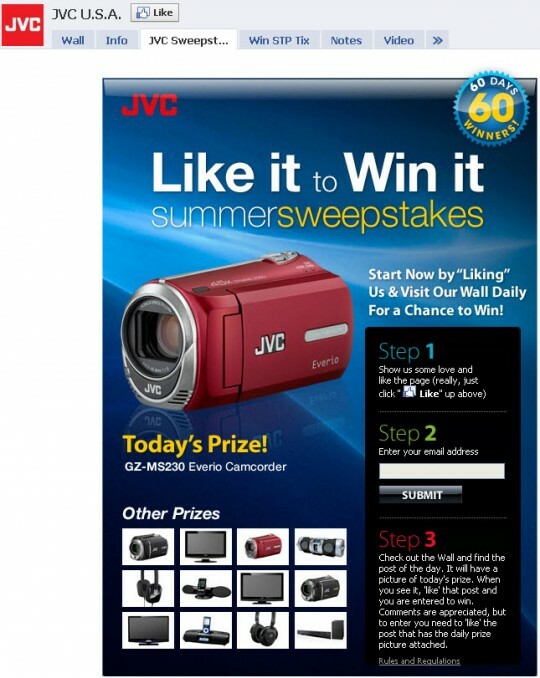 But as of today (Monday) the sweepstakes content is still up on the JVC USA page and the promotion is still running. So what gives? I’ll update this post if anything changes on the JVC Facebook page or I learn more. And if anyone has any additional information please let me know. Facebook requires that brands get approval in advance and spend at least $10k, which is what JVC did. Anything outside of that is a violation of the TOS. Facebook has some internal miscommunication where our rep didn’t tell others about this campaign– so these uninformed reps had jumped on us. It’s since been cleared. 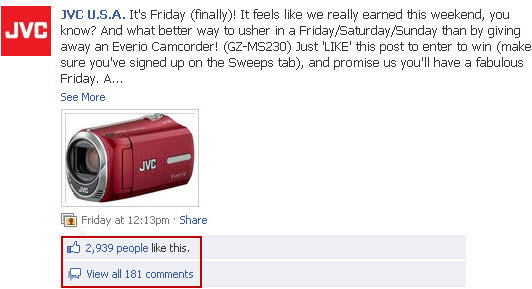 This likely explains why the sweepstakes is still active on the JVC Facebook page. It is a clever promotion that has done well for JVC so I am glad to see it continue. But based on Dennis’ input it sounds like the promotions guidelines change based on how much money a company is willing to spend on Facebook for a particular promotion. Does that seem right? I had found it interesting that there has been rumors that facebook would allow or approve of a contest or page promotion that was walking the line of a violation based on the companies size. This seems to prove that wrong though. Brandon – based on the information from Dennis Yu that I just added to the post, it sounds like with the right budget and advanced approval Facebook’s promotions guidelines can be modified. If that is the case then larger companies do in fact have an advantage. Once again it is proven “He who has the gold makes the rules.” Yes, I’m just a teeny bit cynical.